I’m sure many of you think the Soviets simply copied the Fiat 124 to create the Lada 1200 and all its numerous siblings, but now that we bought one, it’s time to show you how far that is from what happened. There’s nothing romantic about the genesis of Lada. The Fiat 124 won Car of the Year for 1967. Meanwhile, the Soviets were looking for a family car that could be mass produced locally at a dedicated city and then sold at a reasonable price even in foreign markets. Said car also had to be durable enough to deal with Soviet road conditions. Luckily for Moscow, the Italians were communist enough to sell their cars to just about anybody with enough hard currency, but in this case, shipping over the used tooling just didn’t cut it. 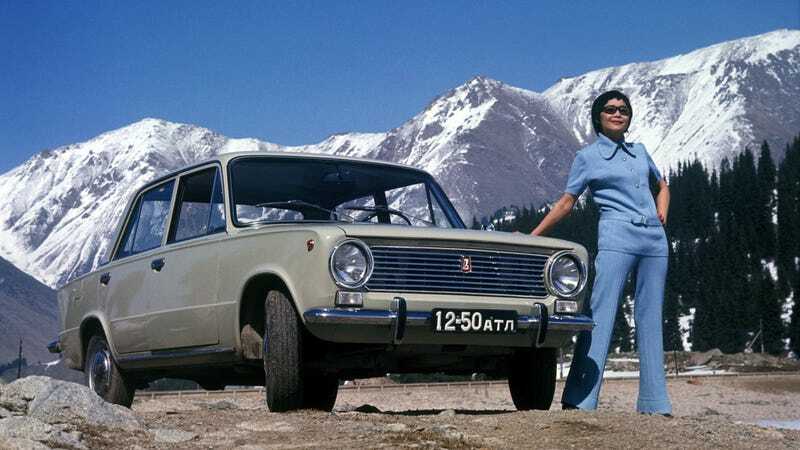 Therefore, the Italians were commissioned as early as in 1966 to re-design their 124 sedan completely, then set up an assembly line, train the workers and give the people of Togliatti a product they could be proud of. The Fiat 124 had an OHV engine with pushrods while the Lada 2101 featured a more advanced OHC design. The Fiat has a horizontally mounted Solex carburetor while the Lada came with a vertical Weber-style unit. The Fiat uses a dynamo, the Lada has an alternator. The Fiat 124 has a cable-operated clutch while the Lada has a hydraulic one. The Fiat had disc brakes in all corners while the Lada came with drums at the rear. However, the Fiat had a single circuit brake system while the Lada was upgraded to a twin circuit. The Lada’s suspension was raised, beefed up and simplified to take the abuse equally well on and off the road, so the Fiat handles and rides better. The Lada is made of thicker steel. Too bad they left the unpainted bodies outside just a bit too long, so rust was pretty much a given in a year after delivery. Four lifting points on a Lada, only two on a Fiat 124. The Fiat 124 has no skid plate. The Russians opted for one. Coolant temperature is displayed on the Lada’s dash, but the Fiat only let’s you know when it’s already boiling. These are the basics, but pretty much every other detail was changed for the Lada as well, and if you want to dive deep into the subject and look at some great pictures of the pair put side by side, I highly recommend reading Zsolt Csikós’ piece from last year.